Jeremy Moghtader is doing his part to help new vegetable growers succeed by working to make farming a more prosperous, secure and sustainable career choice. The efforts of Moghtader, Michigan State University Student Organic Farm manager and head of the school’s Organic Farmer Training Program, were on display in mid-October as part of MSU’s new Farmer Field School. Holistic soil management, including fertility, cover cropping, weed management and tillage, were among the topics discussed by Moghtader and other speakers. Moghtader took participants to various cover crop settings on the farm, including one freshly planted with a rye and vetch combination. “You have to remember, most of the biomass from both the rye and the vetch will happen next spring,” he said. “I want it in a window to precede something I’m not planning on planting next year, so I can let it grow out to early May, have it be high and fully vegetative and holding biomass-suppressing weeds. It also contributes up to 250 pounds of nitrogen per acre in the case of vetch. It’s not all biologically available in the first year, but that’s fantastic. So then I can grow this in one year and live off the benefits going forward. “If I get a nice mix of vetch, a half vetch mix, it breaks down fairly quickly because all of the nitrogen in the vetch mixes with the rye,” Moghtader said. “We’re trying to kill the rye when it’s vegetative. A lot of people will say the easiest time to kill rye is when it starts to make its seed head. Rye and all grains go through a couple of phases. The first phase is like vegetative; the second phase is called the booting up stage. You can feel inside the stem. You can’t see the flower or grain head yet but you can feel that it’s fat at the base, starting to make a stalk. Moghtader pointed to an area of chickling vetch, that he called “superfast, puts on a lot of biomass and purports that it can fix as much as like 90, 100 pounds of nitrogen in as little as 60 days. The seed looks more like a pea – you can see it’s just very tender and vegetative. It will winterkill, and it’s not something you can use over winter. It tolerates a frost but not a hard freeze. “The Farmer Field School is designed to work with growers in their first 10 years of production, to help provide hands-on, continuing education opportunities hosted on farms and co-lead by farmers,” Moghtader said. The Field School is part of a broader vision and collaboration among statewide organizations including the MSU Center for Regional Food Systems and Michigan Food and Farming Systems. The materials used in the sessions are based on work that is supported by USDA’s National Institute of Food and Agriculture. 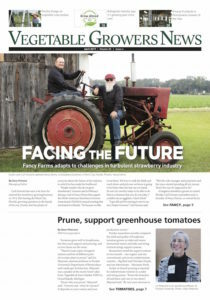 “Statistically, start-up businesses across sectors, including farming, fail at rates of over 50 percent in the first seven years; the goal of the Farmer Field School is to help start up farm businesses succeed,“ Moghtader said. For more information on the Farmer Field School visit here.